LinearGaugeLabels element represents the scale labels displayed next to the ticks. The smart tag allows you to configure the most commonly used properties. LabelsCount: Controls the number of displayed labels. LabelFormat: Allows you to format the labels text. LabelLocationPercentage: Controls the labels location. The property controls how far down/left the labels must be shifted. The offset is calculated according to the labels center. 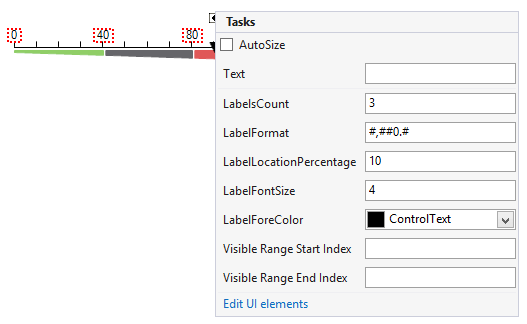 This means that if the property value is 0 only the half of the labels will be visible because the center of the labels will be at control border. LabelFontSize: Controls the size of the labels' text. ForeColor: Controls the fore color of the labels. LabelStartVisibleRange: Indicates at which value the labels start. The LinarGauge control has a start and end value. The LabelStartVisibleRange value must be set within this range and the first label will be shown at this value. LabelEndVisibleRange: Indicates at which value the labels end. The LinarGauge control has a start and end value. The LabelEndVisibleRange value must be set within this range and the last label will be shown at this value.